Recently, Nanjing High Accuracy Marine Equipment Co., Ltd. (hereinafter referred to as ��Nanjing High Accuracy Marine Equipment�� or the ��Company��), subsidiary of NGC Marine, has received enormous orders and great news one after another. Since last year, Nanjing High Accuracy Marine Equipment has been going against the market and has received bulk orders requesting rudder propulsion systems involving green energy, harbor construction, and marine ships. There have been orders for over 40 sets of rudder propulsion systems, among which 6 sets were for offshore wind power installation vessels involving green energy, 28 sets for propulsion systems of full-rotation tugboat rudders for harbor construction, 5 sets for marine ships, and 1 set each for 715th Research Institute of CSIC�� offshore comprehensive experiment facilities and rudder propulsion systems of Yangtze River entertainment ships. These orders have laid the foundation for Nanjing High Accuracy Marine Equipment in its endeavor to become a leader of rudder propulsion systems. These years have witnessed more and more equipment dealers of wind power working on offshore power generation. The enthusiasm for developing green energy keeps rising. Nanjing High Accuracy Marine Equipment remains on top of market opportunities for installation ships and has received bulk orders in the field of green energy. Currently, the 4 full sets of electric rudder propulsion systems supplied by the Company for 1,000-T wind power installation ships of CCCC Third Marine Engineering Co., Ltd. have passed the commissioning process. This included 2 sets of 1,500-kW single-oar propulsion systems and 2 sets of 800-kW single-oar propulsion systems, which met the design requirements of various performance items. Moreover, the 2 sets of electric rudder propulsion systems supplied for Longyuan Zhenhua��s wind power installation ships have been put into commission for nearly half a year with stable operation and reliable performance. The 2 sets of 1,500-kW single-oar rudder propulsion systems for Tianjin Daoda��s wind power installation ships are about to be put into commission; 3 sets of full-rotation lift-type systems for Fengfan Floating Crane of CCCC Third Marine Engineering Co., Ltd. are also about to be put into commission. In recent days, the Company has received an order for a total solution electric propulsion system of a 76.8-m wind power installation ship from a Taiwanese client. This includes 2 sets of 1,300-kW single-oar rudder propulsion systems and 2 sets of 1,200-kW side propulsion system. As for port construction, the NRP 160 rudder propulsion system deployed by Nanjing High Accuracy Marine Equipment for 3,200-horsepower full-rotation tugboats at the Port of Nantong have been used for over a year and is functioning well, breaking through the dependence on imports of core equipment for domestic ports. The NRP 180 rudder propulsion systems deployed for fire-fighting and tugging dual-purpose ships of Nanjing Tanker Corporation, CSC have been used for over six months and are functioning well. The NRP 140 rudder propulsion systems deployed for recovery ships of spilled oil at the Port of Yantai were also put into commission and received high praise from customers. Recently, Nanjing High Accuracy Marine Equipment has received an order requesting rudder propulsion systems of two full-rotation tugboats from the Port of Fuxing in Shanghai, including one plan detailing propulsion systems of hybrid rudders. The application of a propulsion system of a hybrid rudder is a first for tugboats of ports. As for rudder maintenance and the supply of spare parts for the same type of products abroad, Nanjing High Accuracy Marine Equipment successfully repaired 2 sets of US1401 rudder propulsion systems of Rolls-Royce at the Port of Fuxing and the Port of Yantai, 1 set of US 205 rudder propulsion systems at the Port of Nanjing, and Schottel SRP 1010 rudder propulsion systems used by the military. The propulsion systems saved lots of time for users with guaranteed performance and have been used for nearly six months upon repair. They were functioning well and highly appraised. Nanjing High Accuracy Marine Equipment has the ability to repair and maintain various types of foreign rudder propulsion systems. As for marine ships, while international crude oil prices are plummeting and the global market demand for the marine engineering equipment is largely shrinking, the rudder equipment of Nanjing High Accuracy Marine Equipment has nevertheless been successfully applied to several marine platforms. Moreover, the Company has recently received five orders requesting total plans regarding propulsion systems for the marine platform, including three from Hong Kong Huachen (Group) Co., Ltd., and two from Tianjin De-sail Machinery Equipment Co., Ltd.
Nanjing High Accuracy Marine Equipment has finished the design and commissioning of a whole NRP series of rudder products through years of strenuous efforts with the application performance of nearly a hundred ships and the maximum power of single oars reaching 6,000 horsepower. The products have won 23 patents including 5 invention patents. They have passed provincial technical appraisal and are able to totally replace imported equipment of the same type with their performance reaching domestic advanced level. They have become New High-tech Technical Products of Jiangsu Province. The products have successively won the golden prize of Outstanding New Products of Jiangsu, first prize of Jiangsu Machinery Industry and Sci-tech Progress, Nanjing Famous Brand Product, and other provincial and municipal technical awards. 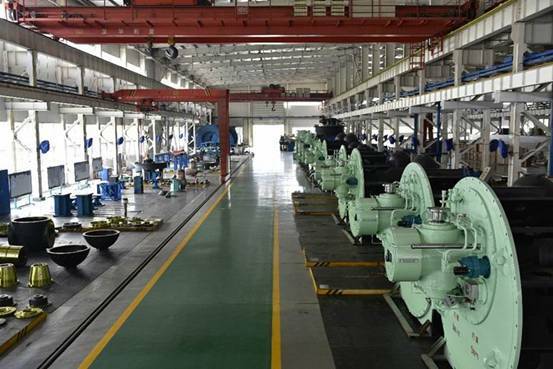 The products were recognized as the first set of major equipment in Jiangsu and selected as an industrial demonstration project of the National Torch Program with special financial support from relevant sectors. To further meet market demand, Nanjing High Accuracy Marine Equipment has researched and produced deck-combined rudders, lift rudders, dual rudders, compact mixed rudders, dedicated rudders for platforms, hydraulic rudders, and other new models based on regular propulsion systems for well-in type rudders. The new products were successfully sold to the Southeast Asian market. Recently, when the Company participated in the 14th Asia Pacific Marine Expo in Singapore, more high-end customers favored rudder products of Nanjing High Accuracy Marine Equipment. This has brought new vigor to the expansion of overseas business and improves the core competence of domestic ships and marine equipment, with contributions made to the optimization and upgrade of the industry.